Mabel says - Well this the dream by Wardel and Garnkiny (star and moon). Thats what my mother and dad told me about that dream. The moons skin name was of Jawuru skin who loved his mother in-law which skin name was Nambin, but the people within the tribe told him he couldnt love her as they were the wrong skin. So he left with shame and climbed up a hill and he was looking from on top (of the hill). He told all the people that they were going to die and that he would be the only one coming back alive. He told them, while they were sitting down, " you are all going to die and I will be still alive, coming out. Every three days I will rise from the dead." They all died and he was the only one that stayed alive. He came back as the moon, for three days every month. This is Yariny country in Darrajayin (Springvale station) which lies south of Warmun. This is Juli's traditional country. 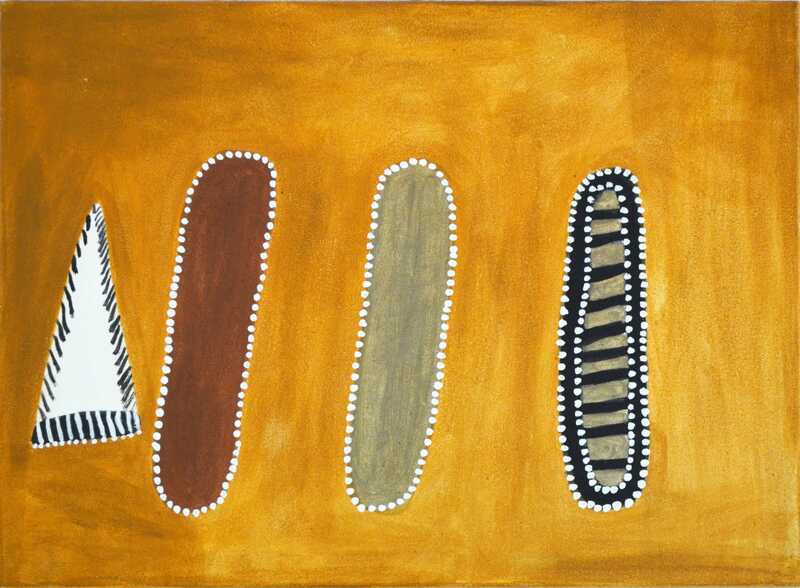 The figures within the painting are representations of Nambin the black headed python (far right) and the garnkiny which is located on the far side in a white triangular. One of the two within the middle is the man of juwurru skin and the other is represented as the hill of where the moon sits.